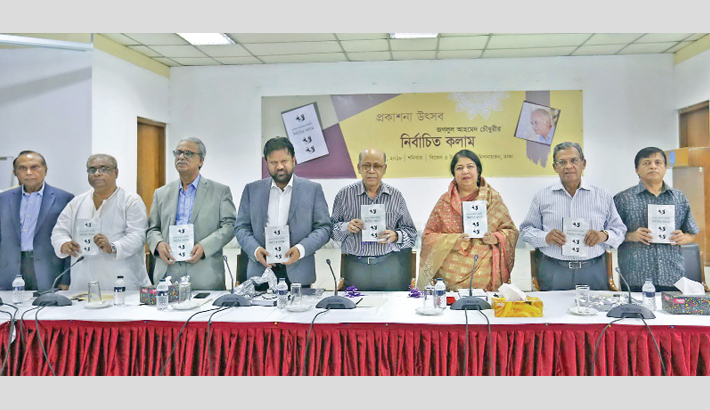 Speaker of National Parliament Dr Shirin Sharmin Chaudhury has termed the writings of late journalist Jaglul Ahmed Chowdhury as the sources of inspiration for young journalists. She said this while unveiling a book tilted ‘Selected Columns of Jaglul Ahmed Chowdhury’ at CIRDAP auditorium in the capital on Saturday. Jaglul Ahmed Chowdhury Memorial Trust arranged the function. The speaker said Jaglul Ahmed Chowdhury wrote columns on international issues, particularly on the South Asian ones. The international analytical writing is very difficult, but he used to do the job keeping the country’s interest, she added. The speaker said he was a friendly and humane one. President of Jaglul Ahmed Chowdhury Memorial Trust and also Food Minister Md Qamrul Islam presided over the progarmme while secretary general of the trust and editor of the daily Bhorer Kagoj Shyamal Dutta moderated it. Former Foreign Affairs Secretary CM Shafi Sami, former managing director of BSS Manaj Roy, president of Banani Society Shawkat Ali Dilon and former general secretary of National Press Club Swapan Kumar Shah, among others, spoke on the occasion.